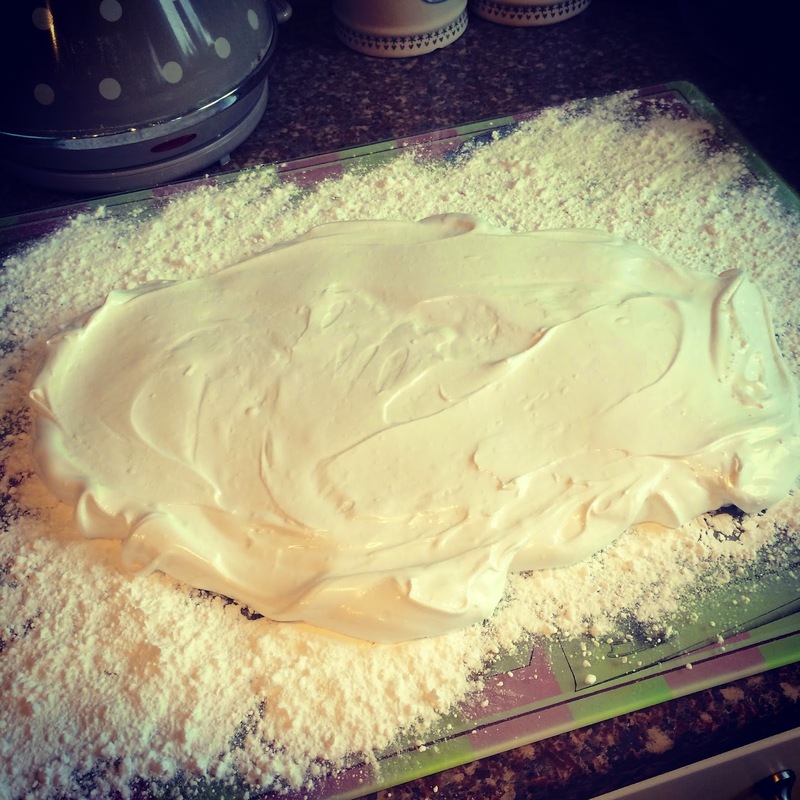 Mrs Bishop's Bakes and Banter: Hubby's Birthday Week of Food….and How I Manage to Maintain My Weight! 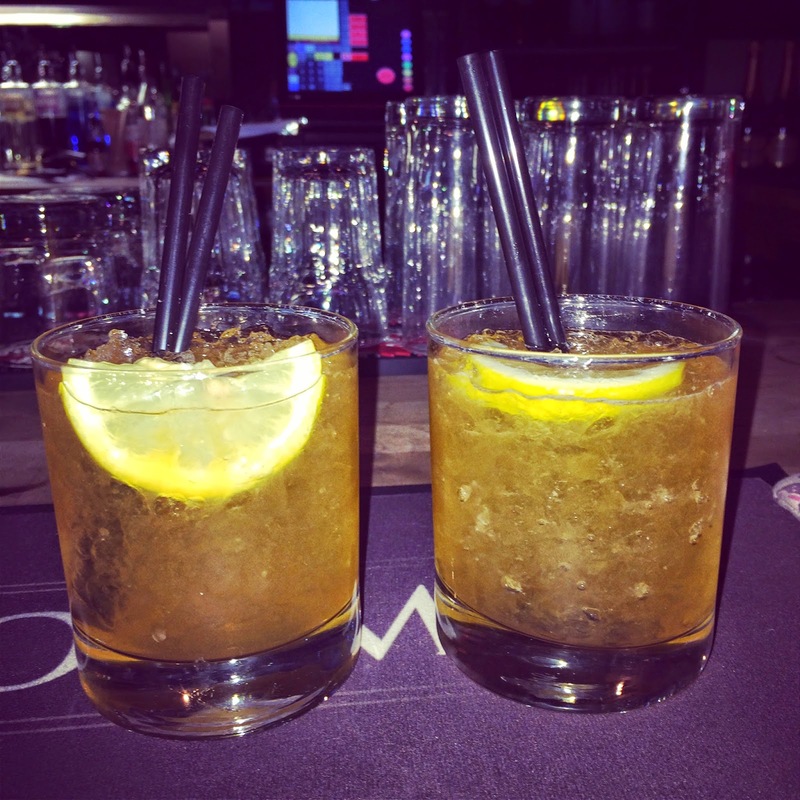 Hubby's Birthday Week of Food….and How I Manage to Maintain My Weight! Hubby turned the big 3-0 on Wednesday this week - and, being as food-obsessed as I am, most of the celebrations we arranged were food-based. 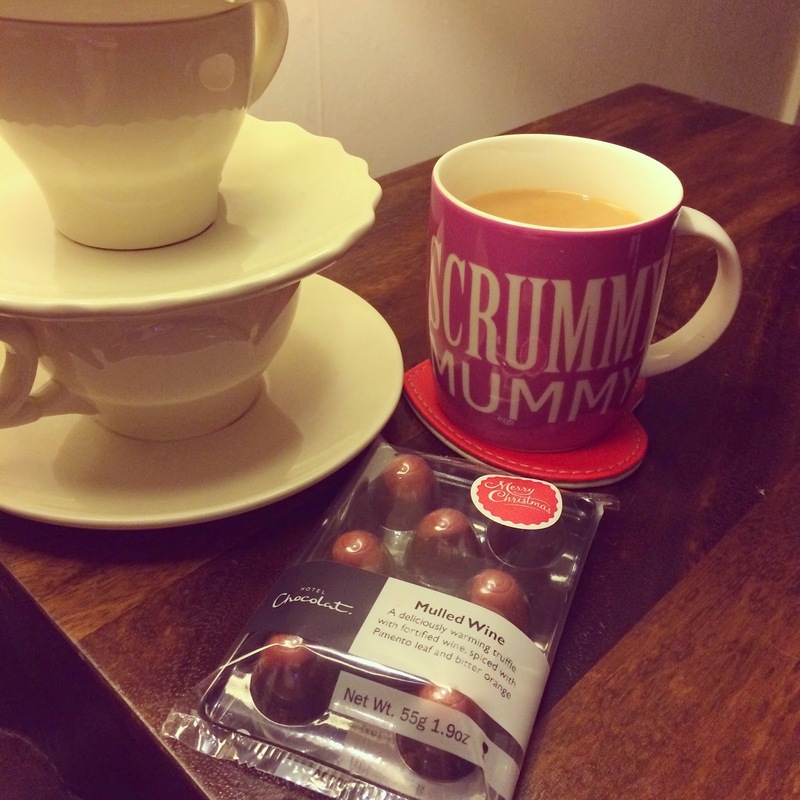 Hubby and I visited our favourite chocolate shop - Hotel Chocolat when in London last weekend, and picked up a few delicious treats - mulled wine truffles and super milk puddles. We had a few with a cup of tea on Sunday night. 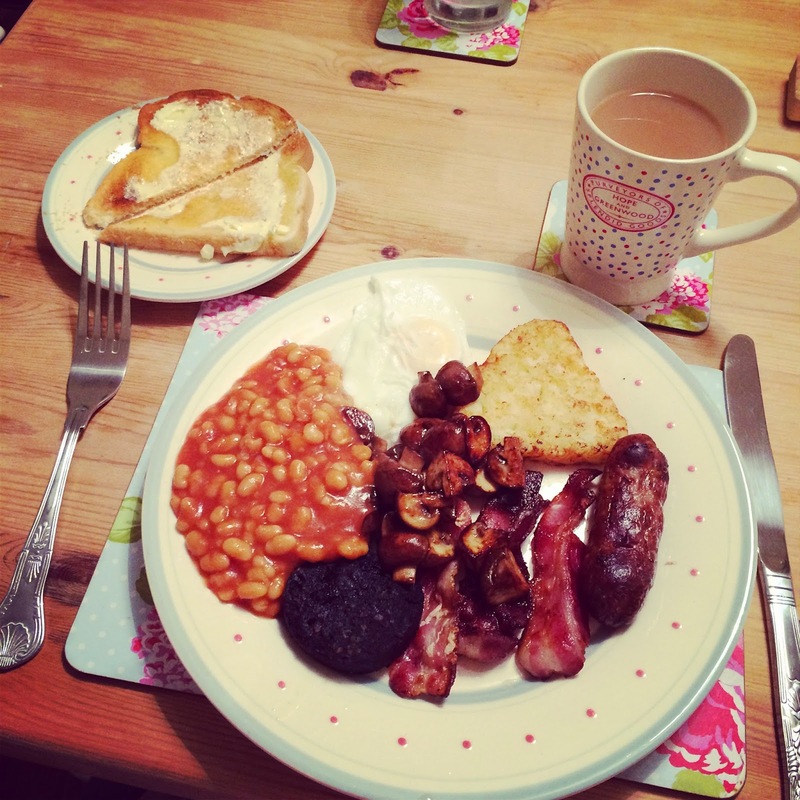 Monday night: Hubby's pre-birthday fry up! He always has to have a fry up on or around his birthday - it's a tradition. We had it for our dinner instead of breakfast as we have a bigger calorie allowance for dinner. 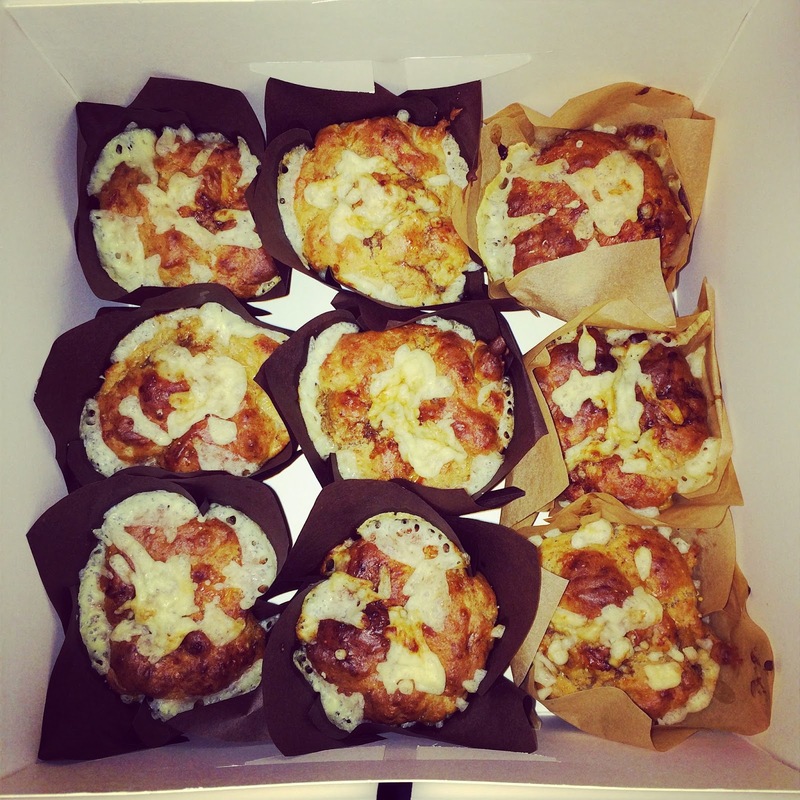 I baked Welsh rarebit muffins (Nigella recipe) and homemade sausage rolls for Liam's friends in his office. I also sent them in a couple of family sized bags of yummy crisps too! Savoury treats make a nice change from all that sugar I usually send in. Lunch on Wednesday: I took Bert on a Mummy & Baby Lunch Date to a lovely new cafe that has opened in Bedford Park (The Pavilion At The Park). 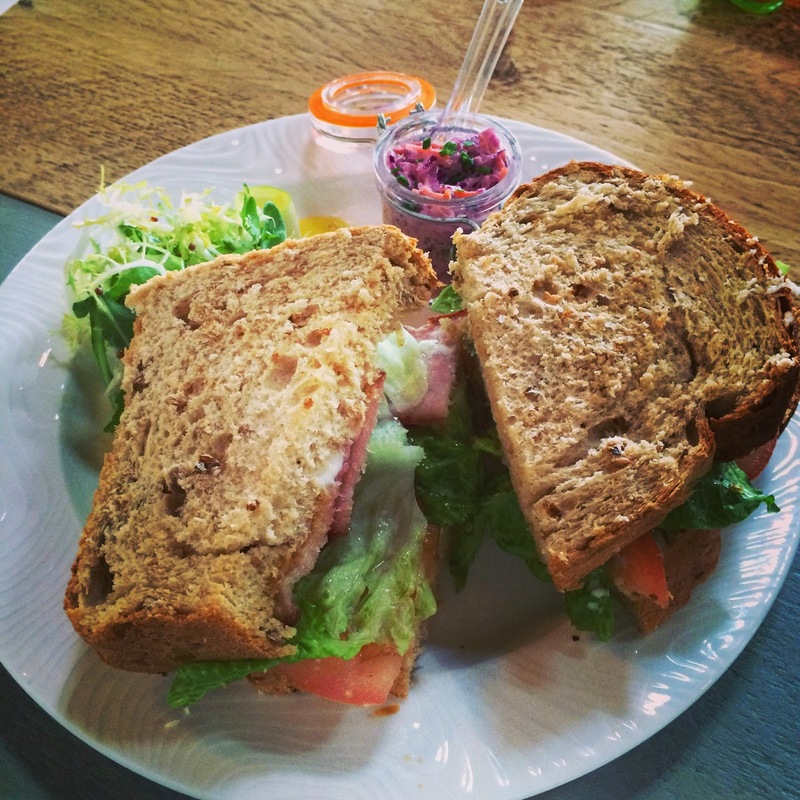 I chose a yummy BLT sandwich, it was truly immense! Weds night: On hubby's actual birthday we went to a Thai restaurant called 'Rice' in Bedford for dinner - it was totally delicious. 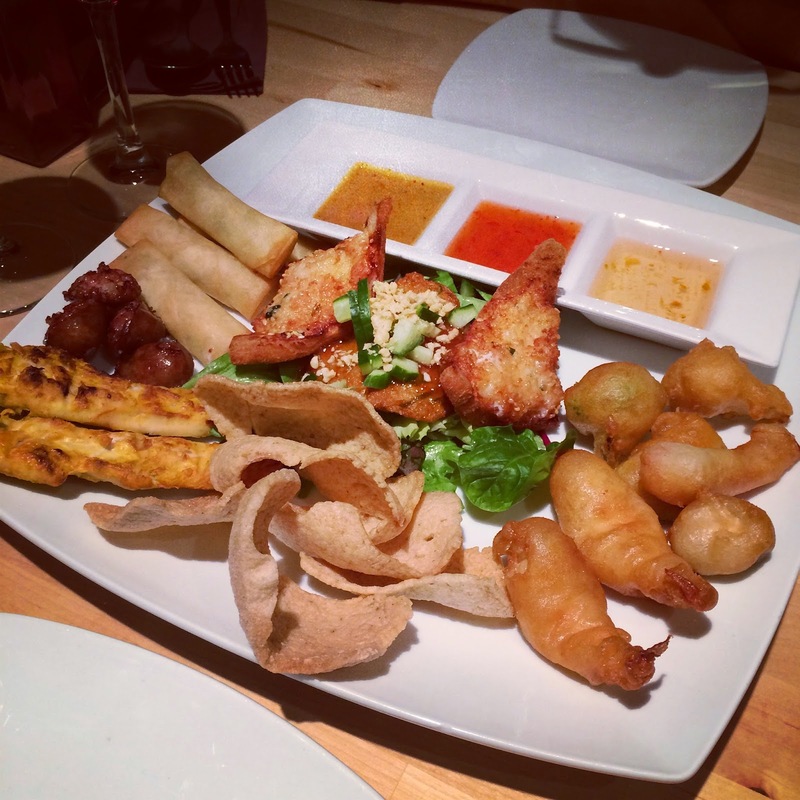 This was our starter platter to share! 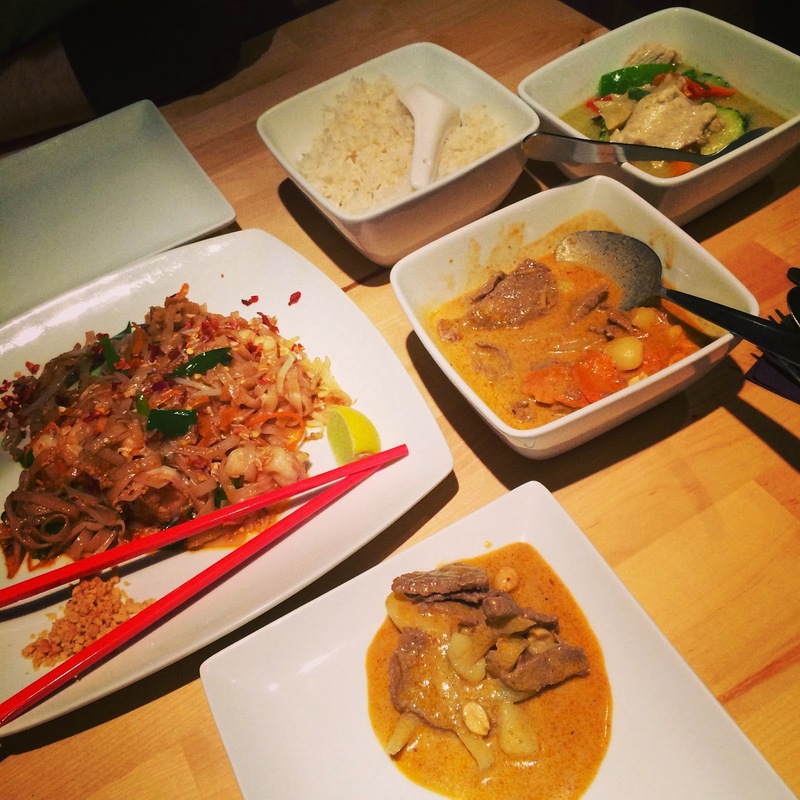 Our main courses: Beef Massaman curry, Chicken Thai Green curry, Prawn Pad Thai and Saffron Sticky Rice. 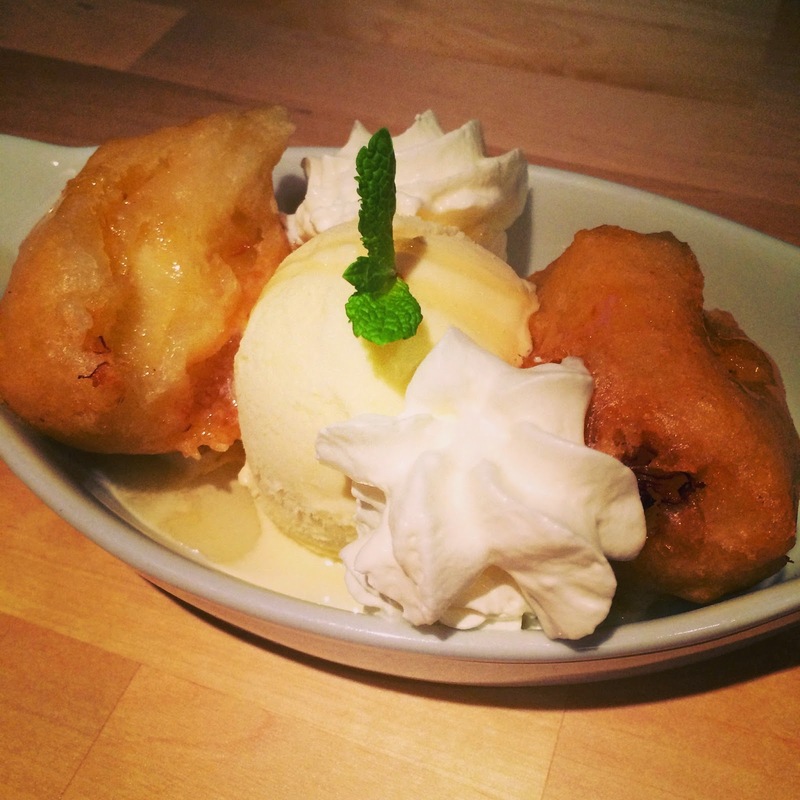 Hubby's pudding at our thai meal: banana fritters and ice cream. 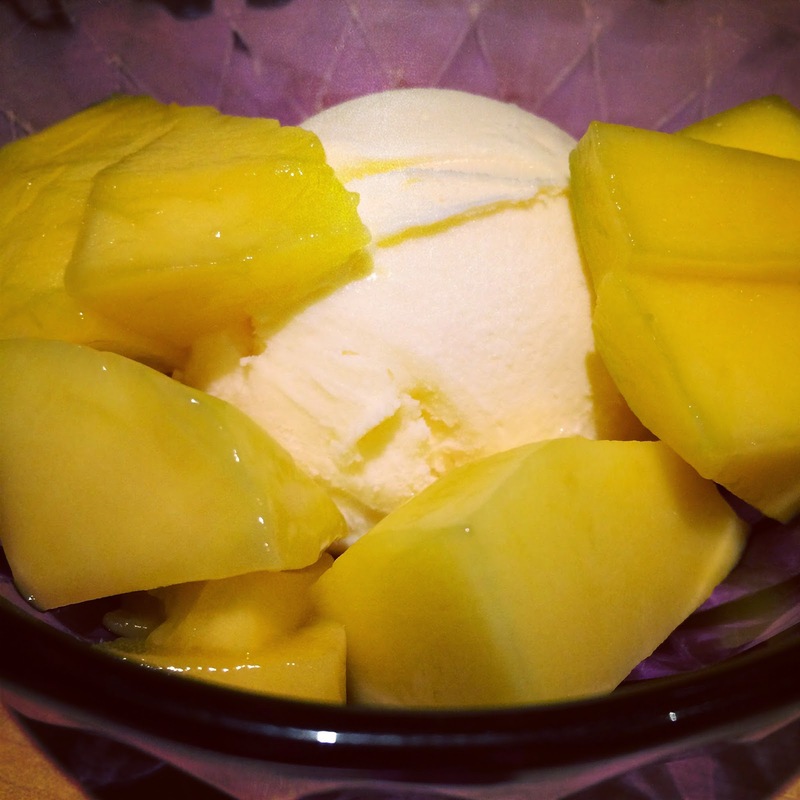 My pudding at our thai meal: fresh mango and vanilla ice cream. We got a lovely surprise at our meal - the waiter came over to tell us that a wonderful lady called Vicky (my cousin) had called ahead of our arrival and paid £40 of our bill!! Amazing! What a truly lovely birthday gift for Liam, and such beautiful sentiment. 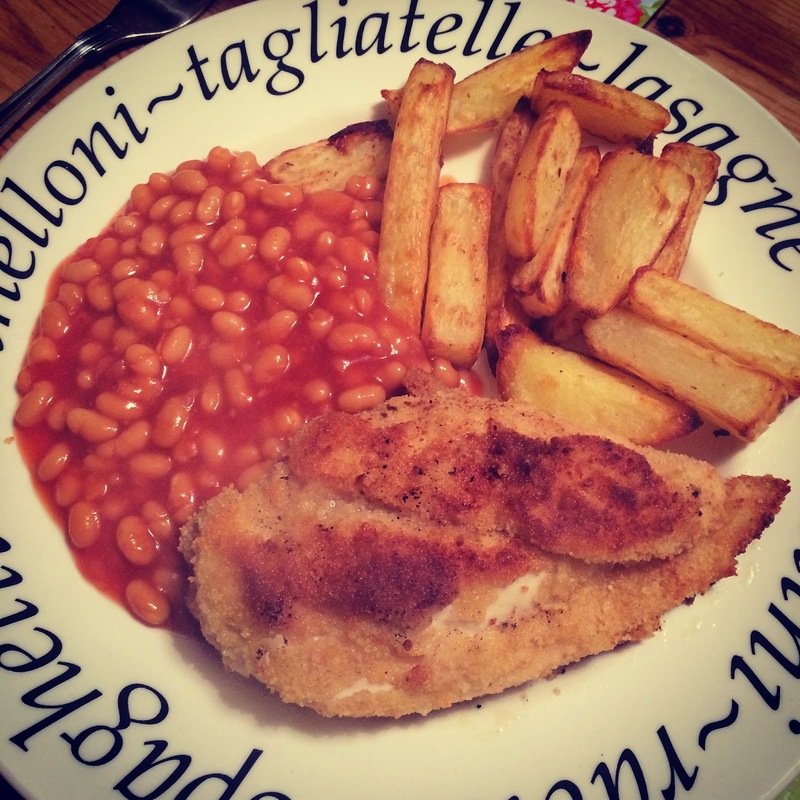 Friday night: Homemade chicken kievs (Liam's favourite meal ever, he has to have it on/around his birthday each year) with homemade Acti-Fry chips, and baked beans. 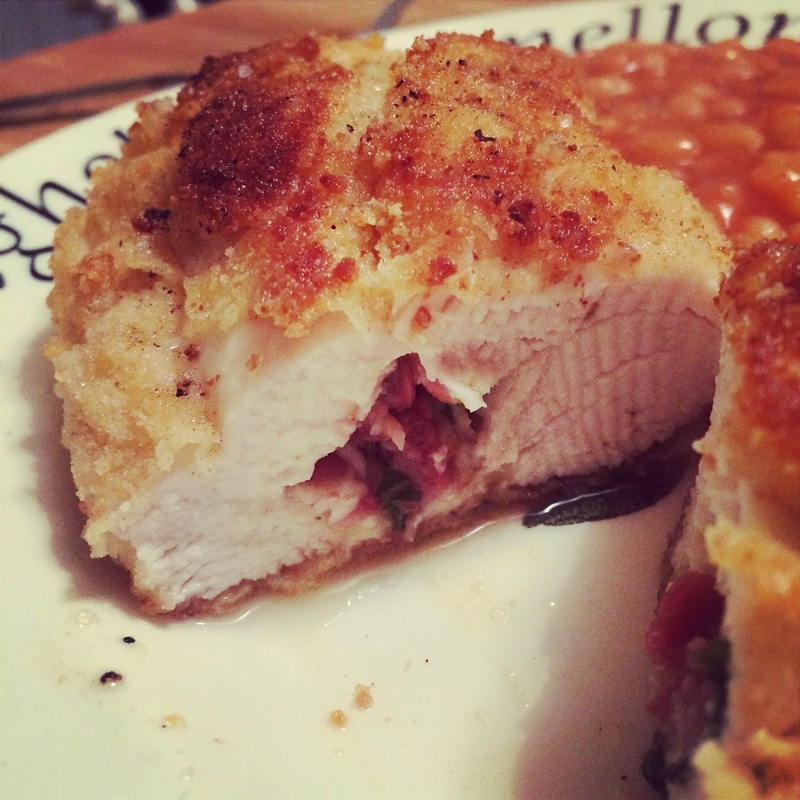 Homemade chicken kiev with garlic, bacon and basil butter. 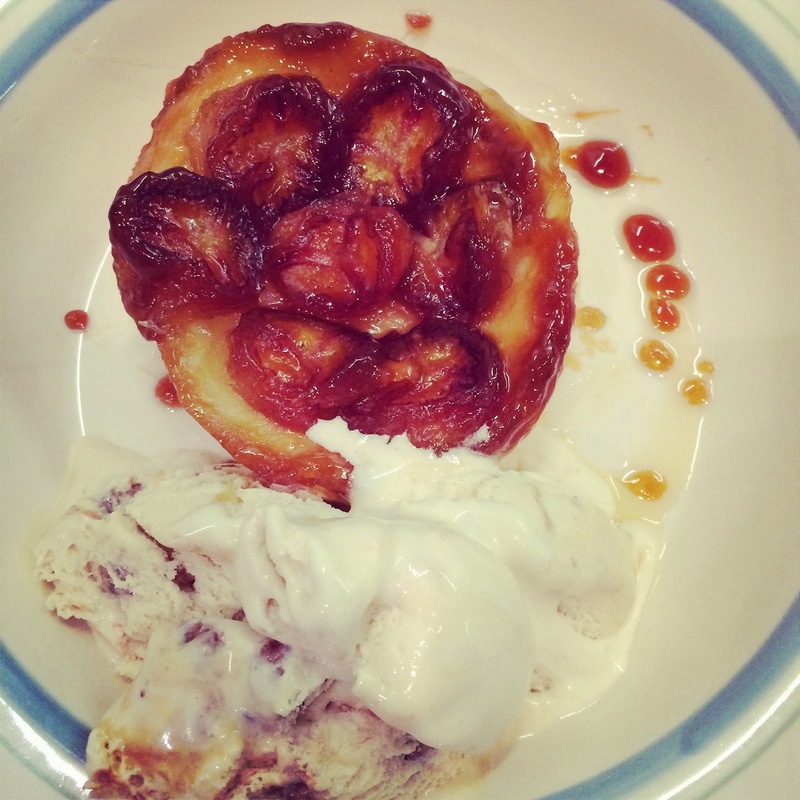 Pudding on Friday night: Homemade banana tarte tatin and ice cream. (I didn't really use a recipe for this, I just made it up as I went along: made a caramel, added sliced banana, topped with a circle of puff pastry and baked in the oven for 20 mins). 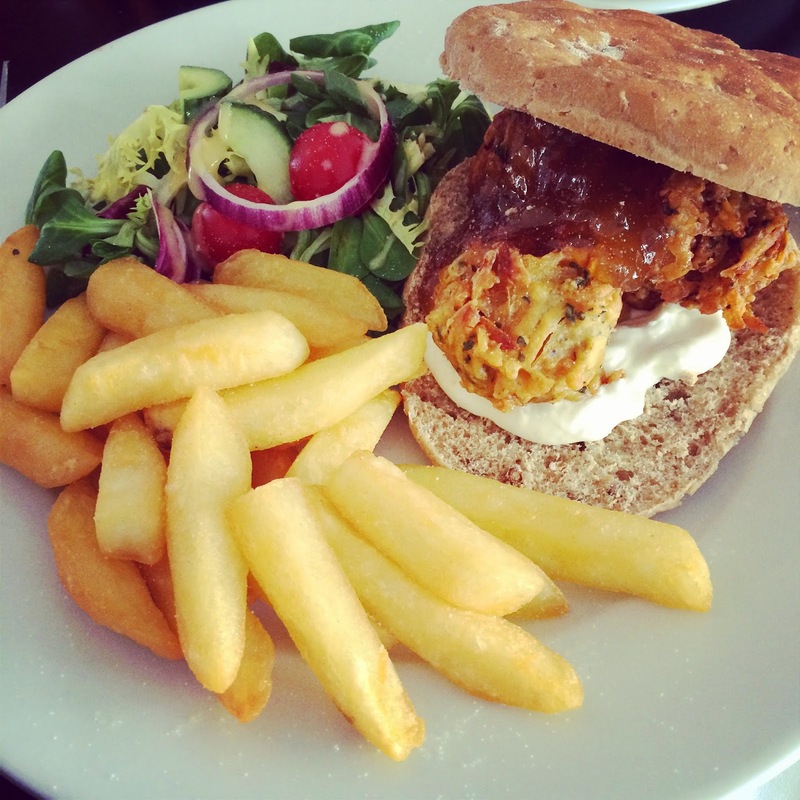 My lunch on Saturday at Riverside Grill in Bedford with Liam's family - the Arji Bhaji burger (3 onion bhaji in a granary bap with mango chutney, and mint mayo) with double cooked chips and salad. Utter bliss! And finally… after lunch on Saturday (instead of having dessert) everyone headed back to our house for tea and birthday cake! 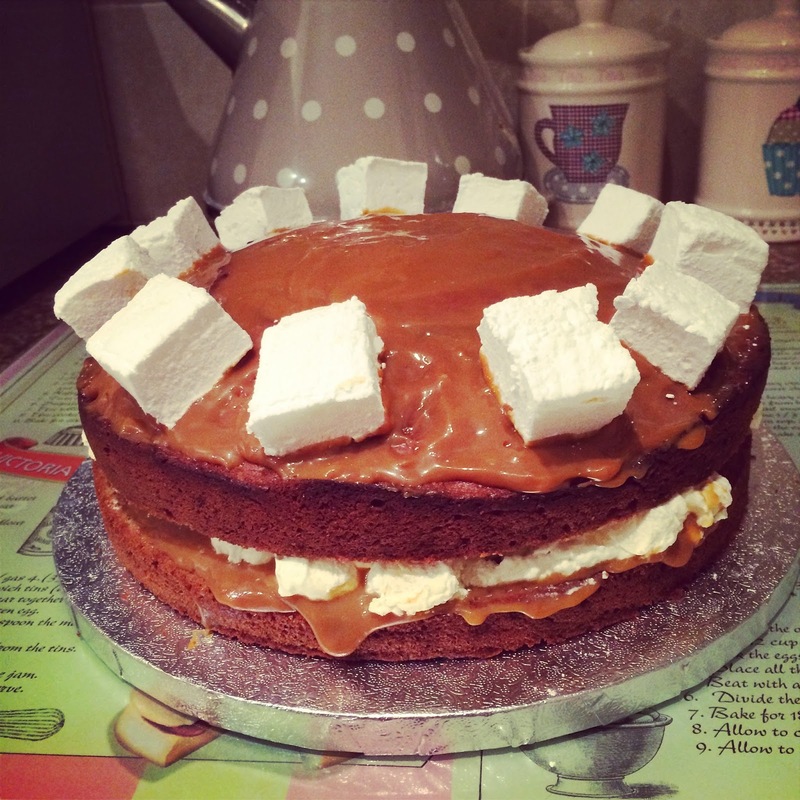 Liam's requested birthday cake this year was Banoffee Marshmallow Cake (with homemade marshmallow) - I've never made this cake before but it was super easy and sooooo delicious! 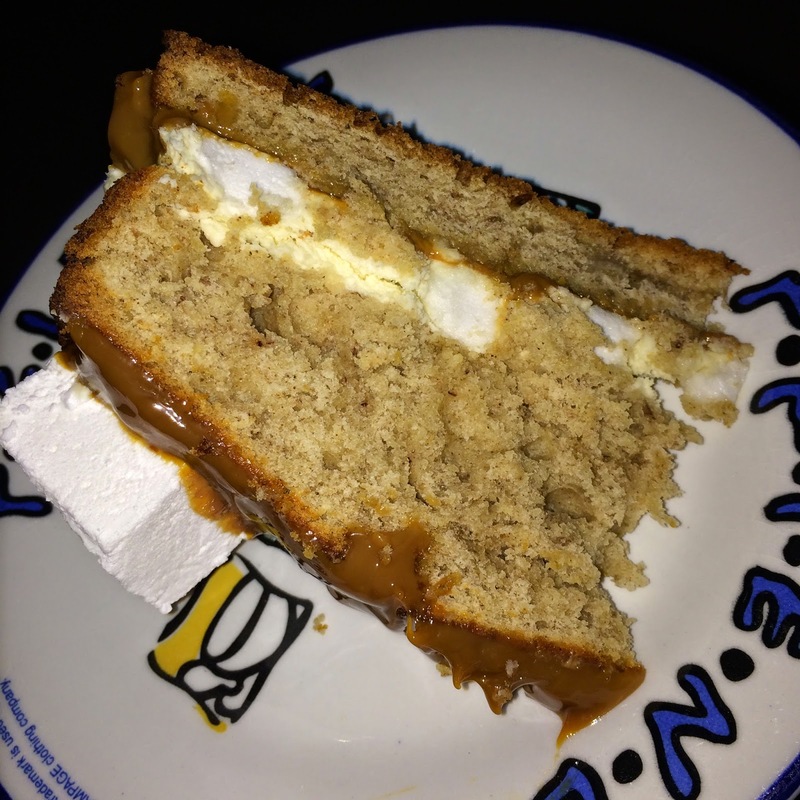 Banana/cinnamon sponge, sandwiched together with caramel and lightly whipped double cream mixed with chopped bananas and chopped marshmallow. 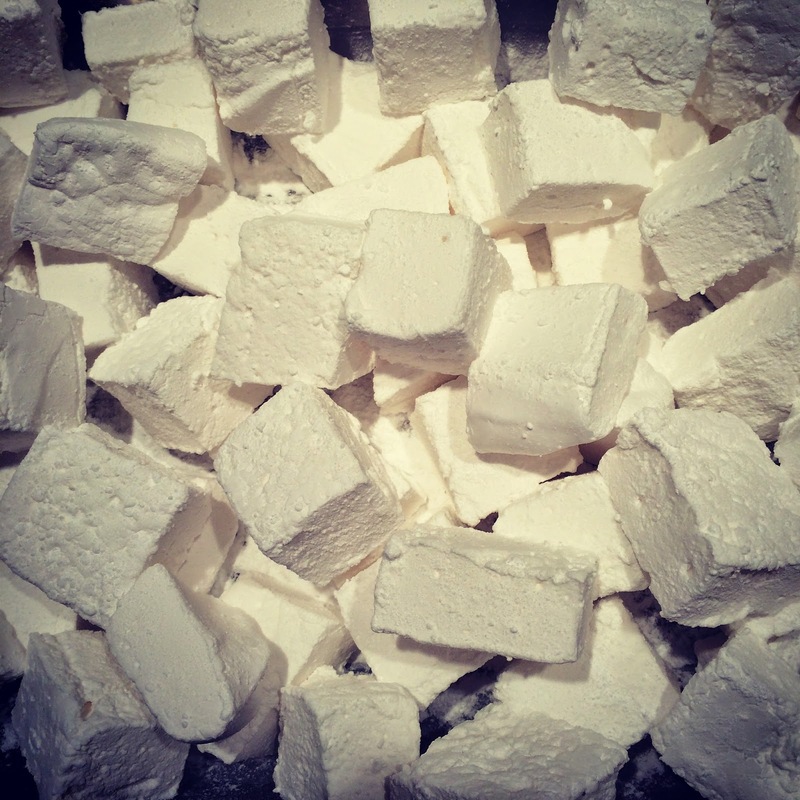 Topped with more caramel and whole marshmallow squares! Banoffee heaven. How Do I Maintain My Weight and Still Eat All of This Food??? For those of you who read my blog regularly you'll know that in the last 15 months I have lost 6 stone 1 lb and counting. Lots of people ask me regularly how I manage to maintain losing weight despite eating lots of treats? So today I thought I'd share a few ways I'm managing it - I hope they will help you to understand my commitment to weight loss and my new lifestyle of moderation. It may not look like I've been moderate this week, but when you combine all of the below you'll see that I have managed to balance everything to ensure that I maintained my current weight this week and didn't put on any at all. I will usually only have one slice/portion of whatever I bake albeit a cake, biscuits, a tart, or a savoury bake (i.e - one sausage roll, one slice of cake, one biscuit, one portion of treacle tart etc) the remaining portions will be shared with friends/family, taken to Liam's office, or Liam will eat it if/when he has the calories available. I try to only bake big items such as cakes, tarts etc for occasions when I know there will be plenty of people to eat what I make such as birthdays etc - this removes the temptation for me to eat any leftovers. On weeks where I know there are going to be many treats that I want to enjoy I will step up my exercise to help burn excess calories. This week for instance I've walked 50 miles burning around 4300 calories in total in order to balance out the equation. I have burnt off the majority of the calories I've consumed, which meant I was able to maintain my current weight and not put any on. On weeks/periods of time when I know we are going to be really busy and have lots of special occasions where I'm going to eat treat foods I don't put the pressure on myself to lose weight. Instead, I try to ensure I just maintain my current weight. Now that I've lost the majority of my weight I am happy to save any further losses to times when I will find it easy to lose, and won't feel as if I'm missing out (i.e. weeks when we have little planned and aren't eating out, baking or celebrating). I have maintained my current weight (11 stone 1 pound) for the last 5 weeks because of many events/celebrations (my birthday, a hen weekend, family parties, meals out, hubby's birthday etc) I am really happy that I have succeeded in joining in with all of these social engagements, have been able to eat and drink lots of nice things, and still maintain my weight - as long as I don't see a gain then I'm pleased. This week (from Friday 21st-Thur 27th) is a quiet one for us, so I'm aiming for at least a one pound loss. I don't waste calories on things I won't enjoy enough to warrant the calories. I've gotten really good at making better choices, choosing to eat treat calories on things I'm truly going to enjoy so much that I won't feel any guilt. I don't on the whole eat shop bought cakes/biscuits, I don't eat sweets as they don't do anything for me, I don't waste calories on sugary soft drinks or milky coffees, and I don't order starters or puddings from a menu when eating out unless I really really like the sound of something. If I'm going to eat a BIG treat (such as a slice of cake at around 600 calories) I now eat it in replacement of my meal (usually lunch) rather than as well as. It was only greed that used to make me eat those treats ON TOP of my usual food intake. It also means that I will have to REALLY want that treat, as I don't like to skip eating a savoury meal that often. When eating 'in front of the telly' treats (chocolate, biscuits, crisps, ice cream) I am very careful to weight out/portion out what I'm going to have first. I always put the calories into My Fitness Pal BEFORE I've eaten it - this makes me totally accountable for what I'm putting into my mouth. By doing this I am making a conscious decision to eat that amount of calories, rather than eating it and THEN realising how bad it was for me calorie-wise. When enjoying 'treat' foods I still calorie count absolutely everything, and my food scales are still used constantly to weigh out what I'm eating. I always work out the calories for all of my bakes using the My Fitness Pal app, and I try hard not to estimate anything if I can help it. This ensures I truly know just how 'bad' I've been, and how many calories I need to make up (burn) in order to make my average calories for that week at a maintain level for my current weight. When using My Fitness Pal I now look at my weekly calories and average daily calories rather than trying to stick to exactly my 1290 calories a day limit. This means that I can go over on how many calories I eat on some days, but just need to be willing to consume under my calorie goal on others to balance it out. I now make my week on MFP start on a Friday:I weigh in on a friday morning, and then usually go over my daily limit Friday, Saturday and Sunday (when we are usually out and about at social occasions) then I can see exactly how bad I've been at the weekend in time for making those calories up Monday-Thursday when there is usually far less temptation, and I'm more likely to exercise. This seems to be working really well for me. That was just a few tips, but I hope they help if you too are trying to lose weight like me. Thanks so much Donna, such a lovely comment & I'd really appreciate the share - thank you gorgeous!